Water quality experts will be pleased to know that our water tests are brilliant. We are lucky to have access to such clean water. 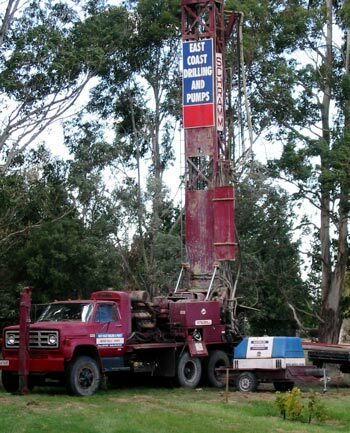 Our well is 42 metres deep and pumps water out of an unconstrained aquifer. In the spring of 2004 I should have been busy digging the new garden, taking before and after photographs. Naturally I had hazy romantic visions of roses scrambling over the pale green water tank, and peonies glowing in the sun. This was to be a flax-free garden! Oops! Neither with spade nor with shovel have I disturbed a single sod of the earth yet. Now where did I get side-tracked to? Just for a few days, this whole area was mentally, theoretically transformed into a rose garden - with standard olive trees thematically linking the flowers with the nut trees. Alas - common sense prevailed (and thoughts of no irrigation, no southerly shelter, gum leaves and gum bark dropping from the sky above, and so on)... A far better idea was to plant cheap, tough New Zealand natives - Pittosporums and flaxes. Well, I planted the New Zealand natives. But that didn't work either - they didn't enjoy the lack of water. And the surrounding grass area was so scruffy. So one by one all the natives were shipped out, and planted in more hospitable places in the garden.